We have number of images used as app assets, for case of simplicity, let's say 10 images only. As far as I understand, Xamarin.Forms will **not **cashe these images, so if I have these 10 images showing in my toolbar (this is just to explain issue, we would not really put 10 images in a tiny toolbar) and I have 5 pages showing same toolbar, that means the 10 images will each be loaded 5 times resulting in total 50 images loaded in memory (5 pages x 10 images = 50 images). I would like to load only 10 images and use them any number of times in the GUI. In addition, if I have to add these 10 images in our repository, I would have to add at least 3 copies of same image to our repository (1 for Android, 1 for IOS, 1 for UWP). I'd like to have one single copy of image that can be shared among all projects and loaded into memory only once but displayed in all 5 pages. So, these 2 issues make be believe there should be a better cross-platform solution so that I can share same image across all 3 platforms and I load an image only once in memory regardless how many times it shows in the UI. Make use of their cache-handling API. Caching of image files should not be conflated with memory usage. Images files that are retrieved from the web can be cached locally in storage - in "The Cache". Images files that are shipped with the App whether embedded or assets/resources are always there, so don't need to be downloaded and cached. A image File is loaded into a Instance of a Image object in memory. If you load the same image file into 2 separate Image object instances, that will take twice the memory. The same applies If you write logic to load the image file into a memory stream and then use that as the source for your Image objects. Each Image object needs a copy of the image data in order to process and display it. So the only solution would be to load the file into single Image instance that is shared among your pages, by adding the instance to each page's hierarchy at the required point, but remember a Image can only have one parent at a time. What if you need to display the same image more then once on a page? Frankly it would not be worth the effort in 99% of use cases. FFImageLoading caches native bitmaps in memory and reuses them. If you have eg. some kind of image which is used 100 times in a ListView, only one bitmap will be used for all rows. That is more memory and performance efficient. Image decoding (which is quite hardware intensive operation) will fire only once. Nice comparison. As you see, caching images in memory will almost always give you some performance boost / memory savings. Unluckily, UWP is not yet very well optimised yet. It's on my todo list. Caching does not apply to assets you are shipping with the App, since they are already there. To avoid having a copy of each image in each platform project simply embed the images in the PCL project. As regards loading multiple times, embedded images are managed efficiently by the framework, but that does not stop you from managing them in code if you wish, though its probably unnecessary IMO. @Hunuman Would you mind elaborating please? I would like to add some additional comment although I accepted the above answer. 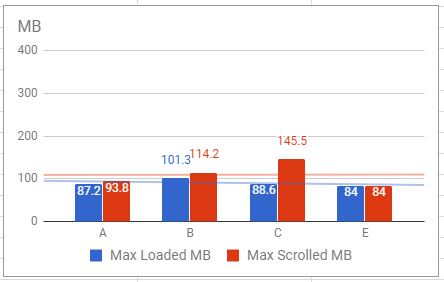 I did some bench-marking using FFLoadingImage caching library vs Xamarin.Forms Image and here are the results for Android and UWP. I am using same project built in Xamarin.Forms and I am loading list view with 1000 ViewCell items each consisting of 1 URL image (so download involved), 7 resource images (on Android that would be AndroidResource image in drawable, on UWP, that would be Content image in proj root) and 6 Text bindings. Text bindings are not hardcoded by random values (name, email, gender, street, city, state and age). ViewCell is not having optimized layout but consists of a ViewCell halding bunch of Label elements, Image (or CachedImage), and 2 nested StackLayouts (one holding address, city, country, other holding 6 images (or CachedImages)). 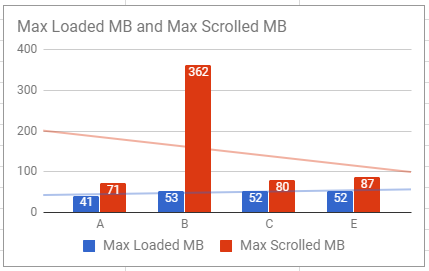 The graphs above represent max amount of memory used to (a) load app and (b) scroll through all 1000 records to bottom of the list view. While on Android, clear winner is to use FFImageLoading library and its CachedImage, on UWP, that is not so clear for some reason. Perhaps more optimization is needed there. But in overal, it seams to be clear that using RecycleElement caching strategy and FFImageLoading is a better way to go in terms of memory consumption. In terms of smooth scrolling, on Android, column E is again clear winner. On UWP, scrolling is smooth enough in all cases and appers to be same but dragging scroll bar is jerky regardless which option I choose. @DanieL I do have problems with Bindings though. Any comment on this question?